Pupkewitz Holdings :: Pupkewitz Toyota Windhoek donates 480 school bags! Pupkewitz Toyota Windhoek donates 480 school bags! 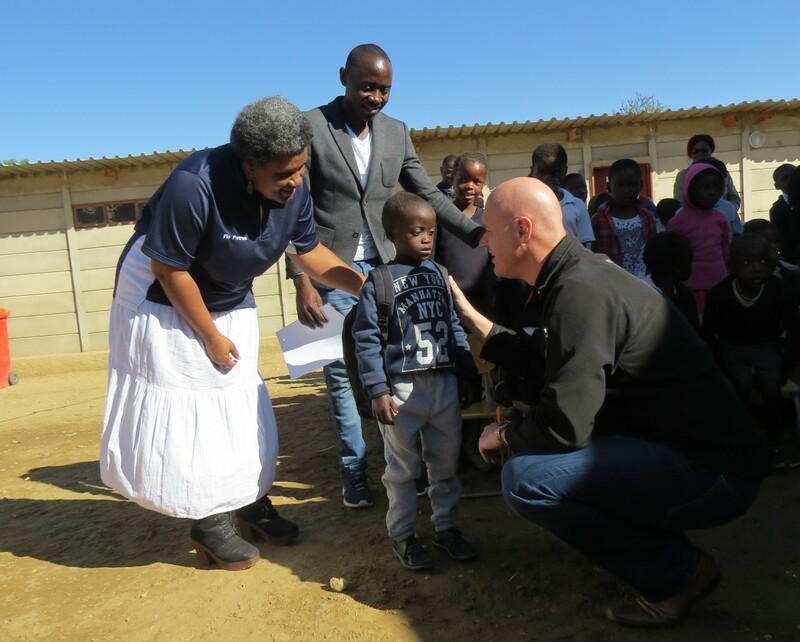 On Friday, 17 June 2016, the Dealer Principal of Pupkewitz Toyota Windhoek, Anton Westraadt and a team of employees distributed the first 100 of 480 school bags to primary school learners as part of their “Future in a Bag” project. The beneficiaries, as identified by the Khomas Directorate of Education, comprised of 50 learners at Augeikhas Primary and 50 learners at Moses Garoeb Project schools in Katutura, who welcomed the Pupkewitz team with songs and prayers. According to the Principal of Augeikhas primary school, Mr Godfried Kavezepa, the moral of the learners have been positively influenced as a result of this special deed. This was affirmed by Gabriel Kasoma, a Grade 5 learner who thanked the Pupkewitz team for coming to their rescue, saying that they are daily being ridiculed by other learners for using shopping-bags as school bags, but now they have the last laugh on their critics. Principal of Moses Garoeb project school, Ms Flora Petrus, equally expressed her gratitude during the delivery of the school bags: “It takes a strong head to do business and a soft heart to give to the poor, Pupkewitz Toyota clearly has both characteristics”, she said. The “Future in a Bag” project stems from a commitment made by Pupkewitz Toyota Windhoek on 1 March 2016 to the Ministry of Education, Arts and Culture to donate one school bag for every vehicle sold during 2016. At the launch of the project, the Minister of Education, Honourable Katrina Hanse-Himarwa handed over 25 schools bags to learners of Auas Primary School. Learners listed to receive school bags in the coming weeks are from Hillside-, Havana-, Dordabis- and Kwakwas primary schools, said Ms Inge Katjiuongua, Regional School Councillor, who also recalled her personal experience as a learner without a school bag and later as a mother who had to stich her children’s school bags during tough financial times. Each “Future in a bag” contains basic stationery, a lunchbox and a water bottle. Dealer Principal, Anton Westraadt further said that as a commercial entity, Pupkewitz Toyota sells its products and services to its valued customers in Namibia – activities that enable the company to generate profits by which its employees are paid and developed. Subsequently, the company contributes to the country’s Fiscus in the form of taxes and aligns its profits to noble causes such as these. The motivation of the project is for the Dealership to donate one school bag to a child in need, for every vehicle sold. Hence the collection of 480 bags over a period of three months by the Pupkewitz Toyota team, after which specific schools, as identified by the Directorate of Education in the Khomas region will benefit from this initiative for the rest of the year. Employees are then involved to deliver the bags at the identified schools in person.